On this state outline map, Indiana is highlighted in color. The State of Indiana is bounded by Kentucky on the south, by Ohio on the east, and by Illinois on the west. It is bounded by Michigan on the northeast, and by Lake Michigan on the northwest. Indiana is the 38th largest state in the United States, covering a land area of 35,867 square miles (92,896 square kilometers). Indianapolis is the state's largest city. The State of Indiana, nicknamed the Hoosier State, comprises 92 counties. This Indiana map site features road maps, topographical maps, and relief maps of Indiana. The detailed, scrollable road map displays Indiana counties, cities, and towns as well as Interstate, U.S., and Indiana state highways. The pannable, scalable Indiana street map can be zoomed in to show local streets and detailed imagery. to view a scalable Indiana road map. The detailed Indiana map and the regional Indiana map display cities, roads, rivers, and lakes as well as terrain features. The detailed map shows only the State of Indiana, while the regional map shows Indiana and the surrounding region. Indiana's capital city is Indianapolis. Other major cities found on the Indiana map include Fort Wayne, Evansville, South Bend, and Gary. Mid-size Indiana cities include Hammond, Bloomington, Muncie, Lafayette and Anderson. In 2005, the population of Indiana was estimated at 6,266,019, which is about 174.9 people per square mile. In 2010, Indiana's population rose to 6,483,802 people. The state's Interstate Highways include I-64, I-65, and I-69, as well as I-70, I-74, and I-80. This extensive highway network, as well as Indiana's long-distance railroads and major waterways, ensure that its agricultural and manufacturing products can be distributed efficiently. The name Indiana simply means "land of the Indians". Northern Indiana is low, flat, and interspersed with small bodies of water. Central Indiana's soil is dark and fertile, while the hilly south is quite picturesque. Important landmarks include the Indiana Dunes National Lakeshore, Lincoln Boyhood National Memorial, and George Rogers Clark National Historic Park. For additional Indiana travel and tourism information, visit the official Indiana tourism site and Indiana Atlas. This online Indiana reference map shows major cities, roads, railroads, and physical features in Indiana. 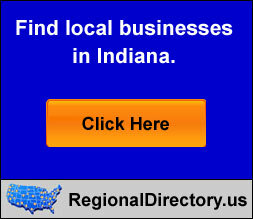 Several map publishing companies offer printed maps of Indiana. For example, Omni Resources offers several maps of Indiana that feature points of interest, airports, and parks, as well as selected local attractions and insets of major Indiana cities. Indiana-Map.org Editor, State Maps, PO Box 775, Barnegat, NJ 08005.